Joe Klecko, who grew up in a blue-collar town near Philadelphia (Chester, Pennsylvania) was a truck driver, boxer and semi-pro football player (under the name Jim Jones) before he began his collegiate career at Temple University. Because of his strength and speed as a middle guard at Temple, Klecko was selected by the New York Jets in the sixth round of the NFL draft. He led the league’s rookies that season with eight sacks. Klecko, at 6-foot-3 and 265 pounds, was the first member of the “New York Sack Exchange,” which became the most feared defensive front four in the early 1980s. In 1981 Klecko finished the season with 20 1/2 sacks, was named to his first Pro Bowl team and was named NFL Defensive Player of the Year. He has played defensive end and tackle, plus nose guard, and was the first NFL player to be named to the Pro Bowl at three different positions. Klecko played much of his career for fellow Polish Hall of Famer Walt Michaels, who took over the Jets in 1977 and turned the struggling team into a contender. They made it to the AFC championship game in 1982, only to lose to Miami, 14-0, on a rain-soaked field. Injuries to both knees ended his career in 1988 after one season with the Indianapolis Colts. You wouldn’t think that a football player could go from the roster of a semi-pro team in Pennsylvania to become one of the greats of the National Football League, but that’s exactly what Joe Klecko did. The hard-working blue-collar player took a rather roundabout route to the NFL, yet he ended his gridiron career as one of the best defensive lineman ever. Joe Klecko Jr. was born on October 15, 1953 in Chester, Pennsylvania, a working class suburb of Philadelphia, the third of four children born to Joseph and Josephine Klecko. The family was active in the local Polish-American community and belonged to the Polish parish, St. Hedwig’s. Joe Jr.’s father, the son of Polish immigrants, was an outstanding athlete in his day who had to leave school during the Depression, but maintained his passion for sports throughout his life. Like his father, Joe Jr. enjoyed athletics but preferred sandlot sports to school sports so he could have more time to work and pursue his passion for cars. After a couple of years Joe joined the semipro Ashton Knights football team. Joe DiGregorio, the Temple University equipment manager and a semipro football organizer, registered him as “Jim Jones” to protect his eligibility, even though Klecko wasn’t interested in playing college football. When the 19-year-old Klecko more than held his own with an amazing combination of strength and speed, DiGregorio got Temple to offer him a football scholarship. It took some convincing from his parents and girlfriend (and future wife), Debbie, but he finally agreed to play for the Owls. Klecko had a good career as a middle guard on the Temple football team (and was a boxing champion as well) but he wasn’t highly regarded by pro football scouts. Expecting to be drafted by his hometown Philadelphia Eagles, he was picked by the New York Jets in the 6th round of the 1977 NFL draft. He began his first training camp as a tackle, but because of his speed was moved to end. As a rookie Joe initially just saw action in passing situations, but started the last five games due to injuries. He ended the year leading all NFL rookies with eight sacks. For a time Klecko was the only bright spot on the Jets defensive line. Within a couple of years, however, some solid drafts helped produce “The New York Sack Exchange,” the nickname given to the defensive line of Klecko, Abdul Salaam, Mark Gastineau and Marty Lyons. In 1981, the Sack Exchange captured the public’s imagination as it became one of the most fearsome defensive lines in NFL history. Klecko emerged as a dominant defensive lineman, finishing the year with a league-leading 20 1/2 sacks, his first Pro Bowl selection, and consensus NFL Player of the Year honors. The Jets made the playoffs for the first time since 1969 but lost the wild card game to Buffalo, 31-27. Joe’s down-to-earth personality made him popular with teammates and fans alike. Despite his great achievements on the football field and the adulation that followed, he always stayed true to his working class roots. In 1982 Joe suffered a ruptured patella tendon in his right knee and played in just two regular season games. However, he worked hard following surgery to rehabilitate the knee and made a remarkable recovery to play in the playoffs. New York defeated Cincinnati and Oakland to make it to the AFC championship game, but lost a chance to go to the Super Bowl when Miami defeated them, 14-0, on the rain-soaked field of the Orange Bowl. Soon after the loss Michaels was fired as coach and replaced by Joe Walton. Klecko moved over to defensive tackle, and was named to the Pro Bowl at that position in 1983 and 1984. At 6-foot-3-inch, 265 lbs., his tremendous strength and quickness, combined with a fierce competitiveness, made him a dominating defender who could overpower offensive linemen. “Some people call it the bull rush,” said former Seattle center Blair Bush. “We call it ‘The Klecko Skate’ because when he hits you, it looks like you’re rolling backwards on skates.” But Joe was more than a great athlete. He was also a quiet, yet inspirational, leader as well as a keen student of the game. In 1985 the Jets switched to a 3-4 alignment, and Joe played nose tackle for the first time. He led the Jets in tackles with 96 and forced fumbles with 5, and was second in sacks with 7 1/2. In Bud Carson’s defense Klecko didn’t play the traditional way by lining up directly over the center, but positioned himself on one side or other of the ball. Joe’s physical talents and football savvy allowed him to control the game from the nose tackle position. He again earned All-Pro recognition, becoming the first NFL defensive player to be selected to the Pro Bowl at three different positions. The Jets made the playoffs, but got eliminated by New England. 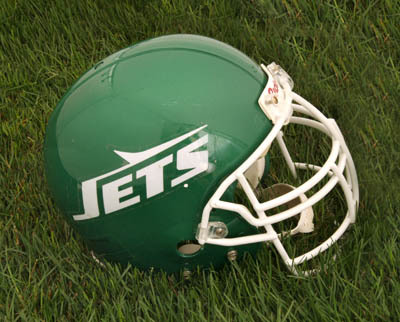 The Jets started the 1986 season with a 10-1 record, but a series of injuries sent the team into a downward spiral. Klecko was having another great year when he injured his left knee and he battled back after arthroscopic surgery in hopes of getting one last shot at the Super Bowl. However, he reinjured the knee in a late season game against Pittsburgh and could only watch as New York was knocked off in the divisional playoff by Cleveland in a double overtime game. Klecko returned in 1987 following major reconstructive knee surgery and both he and the Jets struggled. New York released him at the end of the year and he signed with the Indianapolis Colts. Before training camp he suffered a neck injury in a swimming pool accident and its effects lingered throughout the season, not to mention his two bad knees. Saying “football wasn’t fun for me anymore”, the father of two sons decided to retire at the end of the year. Joe Klecko overcame tremendous odds, and battled through serious injuries, to become of one of the greatest defensive linemen in NFL history. However, he is also remembered as a modest and loyal man who, despite his great fame, never forgot his humble, working class Polish-American roots. Joe followed it up with parts in a couple of other Reynolds’ films, Cannonball Run and Heat.